← Mahathir and Siti Hasmah sing Karaoke! Can Najib and Rosmah do better? Aries46: Hypothetically speaking how would an alleged thief caught with the loot react? He will deny and deny, blame others and concoct lame tales that does not stand up to scrutiny. Sarawak Report knows that PM Najib Razak will not sue. How to sue when he even dares not face the likes of sacked Langkawi Umno leader Anina Saadudin and former PM Dr Mahathir Mahathir who openly called him to account? If not even in our infamous courts, how is he expected to take on Sarawak Report or the Wall Street Journal (WSJ) in an independent court elsewhere? And the worst part of the 1MDB and RM2.6 billion debacles is Najib’s complete failure to refute any of the foreign media exposes. That aside, none of the culprits have thus far accounted for the billions gone astray one way or another. For instance, Najib admits receipt of RM42 million in his personal account but feigns ignorance that it came from SRC subsidiaries. Neither does he account for this huge sum belonging to the taxpayers. This conduct of our PM strikes at the root of his credibility that has led to decline of the nation’s economy and wracked the people’s livelihood. Clearwater: Indeed, if Sarawak Report is slandering dear beloved PM, he should relish suing that pesky website personally. 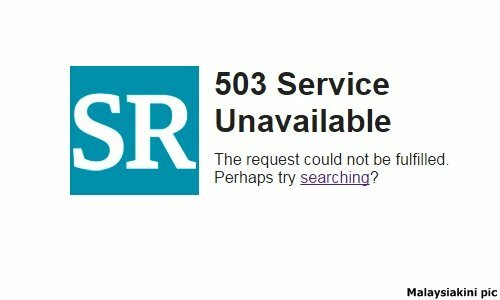 Why use government resources to block its publication? Sarawak Report speaks the facts plainly for all to see, or to sue, but a chicken PM dare not let his guilt be aired in independent court. Swipenter: Najib would sue Sarawak Report when the time is “convenient” just as in WSJ case as advised by his lawyers. So far, he has not even find enough courage to take Mahathir to court for saying far worse things in public but not Malaysiakini, former MCA leader Ling Liong Sik, etc, for obvious reasons. Even then he wanted a settlement out of court for a certain case. Perhaps he is allergic to going to court to personally to give evidence and to answer questions. Odin Tajué: Over the last one year, Sarawak Report has twice already issued a challenge to all those who have accused it of publishing defamatory reports to take it to court. Not one of those people has done so. Which is understandable. Not one of them would be able to prove the portal of defamation — obviously because they all have indeed committed the chicanery and thievery as implied, claimed or charged. This is its third challenge, and it is thrown at Najib. Najib will not pick up the gauntlet, either. Only one free of malfeasances and full of bravery would. He is more than full of the former and completely devoid of the latter. Wg321: It is just a matter of time – Najib is going to ban the Internet. This is because he cannot get rid of an app called Sarawak Report in the Android smartphone or tablet. Everybody who has a smartphone or tablet can go to Google Store and download Sarawak Report app and receive all the latest news from it. We are going to be worse than North Korea. The Malaysian Government has over the past few days taken further draconian steps to silence free media from exposing corruption at the highest levels. On Thursday, Malaysia’s Multimedia and Communication’s body announced that amendments will be made to the Communications and Multimedia Act allowing the Government to block websites that are seen to ‘slander’ the country’s leadership. The authorities are also reported to be attempting to force new ownership on key free internet news portals. The government has already singled out British-based Sarawak Report by uniquely banning and blocking the site, after it exposed multi-million dollar transfers into Prime Minister Najib Razak’s accounts last year, a matter he has proved unable to refute. Also last week, there were further unannounced measures taken to simply shut down platforms being used by Malaysian citizens to access the information provided by Sarawak Report. Medium, a popular website, used by thousands of publishers, including Sarawak Report is also now arbitrarily blocked obstructing Malaysians from access to the entire website. Likewise, an unannounced blackout was also applied against the Hong Kong based Asia Sentinel, which has also doggedly covered Malaysian corruption issues and reported on a number of the investigations conducted by Sarawak Report. The issue which the Prime Minister plainly wants to censor in these ways is Sarawak Report’s latest coverage of further massive dollar payments into his personal accounts and the links between those payments with kickbacks to the former Abu Dhabi fund manager Khadem Al Qubaisi. Al Qubaisi was involved in huge loss making deals with Malaysia’s development fund 1MDB, from which hundreds of millions of dollars have gone missing and unaccounted for. Other stories carried by Sarawak Report over the past week, which have caused shock waves through Malaysia, included the news that Najib has been attempting to negotiate his exit (together with a safe passage and access to all his billion dollar accounts) as well as further details on the death of one of the whistleblowers on the 1MDB scandal, Kevin Morais. Morais was brutally suffocated in a barrel of cement and for weeks the authorities attempted to deny that he had been involved in the investigations into Najib’s accounts. We suggest that, instead of these strong arm tactics against legitimate media coverage, Najib Razak should move to restore his credibility by simply suing Sarawak Report in an independent court of law, in order that the evidence can be scrutinised and witnesses crossed examined. If Sarawak Report and other media are “lying”, as is being suggested by Najib and his supports, then it would be the simplest thing for them to demonstrate that his reputation has been abused. If the Prime Minister is unable to take these steps and sue Sarawak Report then it is an acknowledgement that our allegations are correct and this is the time for him to resign. Currently, his actions are those of a desperate criminal regime which is abusing the fundamental rights of its people, in order to continue its criminal activities and remain in power. Kim Quek: It would be a sad day when The Malaysian Insider – one of the few remaining respected web portals – is turned into another mouthpiece of the Umno juggernaut, following the reported surrender of The Edge Media Group owner Tong Kooi Ong to its pressure. Thus, the window of independent news (on this corrupt regime) that have been filtering through the Internet to this country is steadily closing, following a series of clampdowns by the Malaysian authorities. Such a drastic bent towards totalitarianism as exemplified by the National Security Council (NSC) Bill is attributed to the determination of one man to stay in power – despite overwhelming incriminating evidence against him, as exposed in the 1MDB and RM2.6 billion scandals. Hence, it is of utmost importance that these scandals be resolved quickly in accordance with the rule of law, if Malaysia is to avoid eventually morphing into a dictatorship like North Korea, or a failed state like Zimbabwe. Odin Tajué: Kim Quek, I fear the scandals will not be resolved — at least not in the appropriate manner. As you are doubtless aware, even the circumstantial evidence overwhelmingly points to PM Najib Razak allegedly benefiting billions, but he is there wielding unassailable power, and most involved in the probes are all ‘cari-ing makan’. And haven’t some people been saying Malaysia was turning to be a North Korea or a Zimbabwe? It is not turning to be. In fact, it is already worse than either one. It is Oceania realised. Umno is the Party. The plundering, cowardly, silvery-tongued Bugis warrior wannabe is Big Brother. Non-Umnoputras are Winston Smiths. They are not supposed to enjoy the dignity of having their own name, see? So, everyone is Winston Smith. They all live in the Prole district. You have the Ministry of Truth in Putar Jaya, the new capital of Oceania. Portals such as The Malaysian Insider all make up the Fiction Department in that ministry. Go buy your diary, Winston Smith, but watch your move. Because Big Brother is watching you 24/7 wherever you are. Wybie: I have all along thought that Tong Kooi Ong would yield to pressure. He is, first and foremost, a businessman. The way he allegedly played out former PetroSaudi International executive Xavier Andre Justo speaks volumes of his ethics, or the lack of them. Vijay47: Changing the ownership of a well-patronised news portal need not mean its popularity will continue, since what the people want is a news provider where the reports can be relied on, not propaganda drivel. So if The Malaysian Insider falls into the hands of pro-Najib Abdul Razak forces, it will simply result in another portal biting the dust. With its unlimited – and even growing – funds, Umno can keep buying over news sites not in its favour and administer the coup de grace. But that would not result in the public flocking to the New Straits Times, The Star, or Utusan Malaysia, not even if they were given away free of charge. Who will be the last man standing? Malaysiakini? Isana: With their bunch of cybertroopers and paid spinners not doing a good job in winning the cyber warfare, the next logical step is to intimidate and buy over critical media sites. Well, that’s the power of RM2.6 billion. Malaysiakini is not for sale, said the website co-founders in responding to claims that Umno allies plan to buy out a number of popular news sites, including the country’s No. 1 news portal. Chief executive officer Premesh Chandran said Malaysiakini has not been approached by such investors nor will the co-founders entertain them. “We thank our subscribers for supporting us all these years. With their support, we are able to remain financially viable and independent,” said Premesh. Subscribers pay RM150 per year, or RM388 for three years, to access Malaysiakini. Premesh (photo) said that those who have worked with Malaysiakini would be aware that all editorial decisions are made by the website’s journalists and editors. Meanwhile, editor-in-chief Steven Gan said the co-founders knew from the get-go 16 years ago that for Malaysiakini to remain independent, it has to be financially independent. Gan stressed that it was the intention of the co-founders for Malaysiakini to be led by its team of journalists and editors. KUALA LUMPUR: The Malaysian Insider (TMI) news portal has reportedly been put up for sale after its head company, The Edge is currently downsizing, a local English news daily reports. Citing an internal memo sighted, it states that The Edge is retrenching its staff due to the current economic situation as well as the after-effects of the Home Ministry’s 2-month suspension which negatively impacted its financial position. The report also said The Edge will re-evaluate its plan to go into broadcast news. Meanwhile, KiniBiz owned by MalaysiaKini will shut down its print and online business by 1 February. The official announcement for KiniBiz’s closure will reportedly be made next week. PETALING JAYA (THE STAR/ASIA NEWS NETWORK) – The Edge Media Group is downsizing in efforts to focus on its core business. An internal memo sighted by The Star revealed that the group will be retrenching some staff from various companies, with others assigned new roles within the organisation. With the two-month suspension of their weekly and daily publications significantly impacting their financials, the downsizing could be the group’s way of weathering weak business and economic conditions in 2016 and 2017. The Home Ministry had suspended the group’s publishing permit for three months from July 27 last year, and the Kuala Lumpur High Court on Sept 21 quashed the Home Ministry’s decision to suspend its two publications. With plans to have their own TV news program on a broadcaster falling through, the group’s video content will be reconfigured away from spot news coverage due to a lack of competitive advantage. According to a source, The Malaysian Insider, which is also owned by The Edge, is also up for sale, while both print and online editions of Kinibiz will shut down on Feb 1. This entry was posted in Uncategorized and tagged KINIBIZ to shut down, malaysia press, Malaysiakini, malaysian insider to be sold, media industry malaysia, najib to close down free internet to silence critics?, press freedom malaysia, sarawak report. Bookmark the permalink.